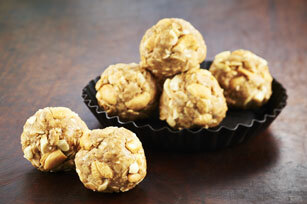 Chia seeds and cashews for added both flavour and crunch to this Crunchy Peanut Butter Snack Bites with Chia recipe. A great snack or afternoon treat, these peanut butter treats are sure to become a new family favourite. These easy-to-make Peanut Butter Snack Bites with Chia can be refrigerated up to 1 week before serving. For a change of pace, substitute ground flax seed for the chia seeds.